Poor Natalie has been grumpy again with another molar coming out, this time on the top left side. This brings her teeth total to 10! She hasn't been eating or napping well, but yesterday she improved and was almost like her cheerful self again. 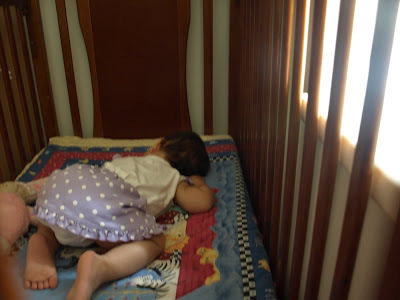 She had a nice long nap in the afternoon. Below are some pics. 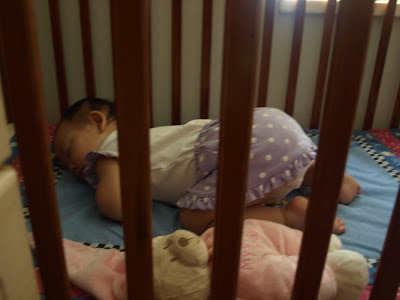 Sound asleep in her crib with her bum in the air. It's her signature sleep move. 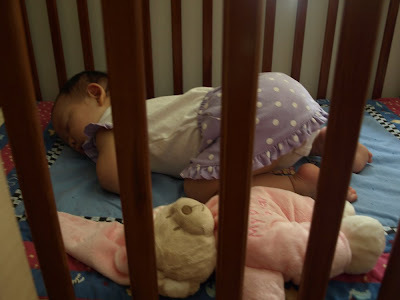 She likes having bedtime bear in the crib with her. Sometimes, she even hugs him when sleeping. She's really long now. 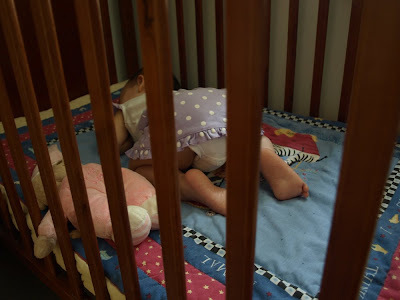 When she stretches out, she almost fills the length of the crib. We may need to upgrade soon! Sometimes, Natalie will also take a short rest on her daddy Clark.